In response to the mission challenge of post-Christendom in the West, all sorts of new expressions of church are arising. Many have helped us discover small cells that offer a place of intimacy and discipleship. Bob Hopkins wrote a book with Mike Breen, which recounts a journey of discovery in an area where we thought we knew exactly how the church worked – the congregation. It tells the story and explores the principles that can radically reconfigure the mid-sized expression of church to recover true biblical congregation as extended family and community in mission. I would argue that one of the disabling effects of Christendom upon the Church is that we have equated church and particularly the congregational expression with a formal Sunday Service that is actually modelled on Mini-cathedral or the biblical temple. I describe this distortion of the mid-size gathering of God’s people as the defective gene disabling us for missions. So, we outline what we believe are biblical social dynamics of a mid-sized congregation or cluster which follows the pattern Paul gives us in Corinthians chapter 11-14 in beings informal, interacting, usually built around food and which is the sum of what everyone brings rather than a front- led presentation. Clusters can enable us to escape this ‘Sunday service trap’. The book also charts a course for transitional church, from inherited models to thoroughgoing missional communities that can creatively express the transforming life of Jesus in as many different forms as the diverse cultures and contexts of our plural society. These creative, flexible, mid- sized missional communities are also very effective in developing leaders. Those who prove effective at leading small groups more naturally to leading a community just a little larger that is still about everyone contributing. Whereas the step to leading a Sunday Service is a bridge too far for most. Then again, whereas cells can be good places for developing members in personal evangelism, cluster two, three or four cells together with a common mission focus and you have sine real mission muscle for significant social engagement. Here is a brief summary of the essence of clusters which we unpack through the course of the book. 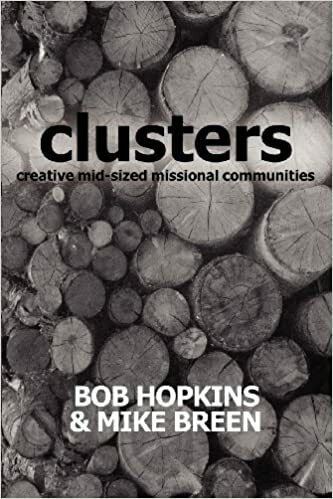 Clusters are midsized groups (larger than cells/small groups and smaller than celebrations) which grow together in their relationship to God as they explore relevant whole-life spirituality (UP). Clusters are led by ordinary unpaid Christians in their non-work time (unless it is a work based cluster), both receiving and passing on Jesus’ pattern of discipleship (UP:IN:OUT:OF). As well as informing and inspiring, this is a handbook of the principles and practice that will equip leaders and people to go on this journey of discovery themselves.